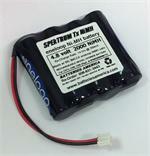 Home > RC Hobby > Transmitter Battery Packs > DX4.8-HR-3U : 4.8volt LONG LIFE NiMH Battery for Spektrum DX9, DX8, DX7s Tx. Choose 2500mAh or 2700mAh. 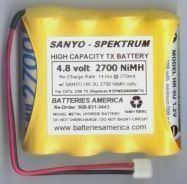 Choose 2500mAh or 2700mAh capacity (made with Sanyo HR-3U Ni-MH cells). 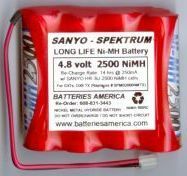 SALE - 4.8volt 2500mAh are $25.95 each. SALE - 4.8volt 2700mAh are $32.95 each. using highest-quality SANYO rechargeable Nickel Hydride cells.